It's exactly a year today since I embarked on the adventure otherwise known as blogging with my first post - In the beginning... or why. I wrote that first post with a mixture of excitement and trepidation, having no idea just what was going to happen next. So everything that has happened since has been a lovely surprise! Just in case it hasn't been abundantly clear to everyone, let me start by saying I have LOVED blogging! It's been a challenge, a joy and a tremendous creative outlet: for writing, primarily, but also for matching images to what I write, which can mean seeing into and beyond the words - seeing them visually, so to speak. But it is the words which have been uppermost, and engaged in a cyclical dynamic, in which reflection leads to writing which leads to further reflection, especially if there have been comments and feedback. And those comments have been another joy. I have not been writing for my eyes or enjoyment only, but engaged in a kind of dialogue with others, in which comments have the power to shed new light on what I have written, making me think and see anew. In the process I have strengthened or formed relationships with several people, especially other bloggers. I have never met most of them, except in cyberspace, but I can recognise and appreciate their writing at a hundred paces. The times when we have each had a different slant on a similar theme have been as enjoyable and illuminating as receiving comments on my own posts. So thank you one and all! A year ago, in that first post, I summed up by saying: This is who, what and how I am, and what I want to share with others. So in this blog I hope to bring together my different loves - of words, photography, creativity - and place them at the service of my central love, the Love that will not let me go. So how has that Love fared on this blog? 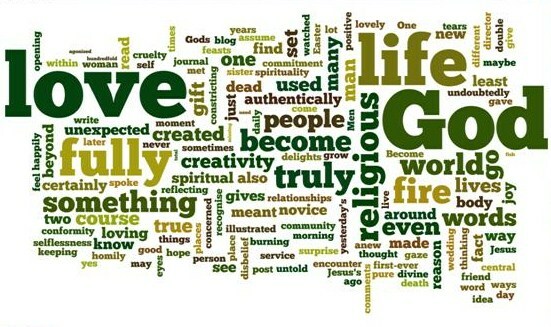 Well, I recently started playing with Wordle, which is a toy for generating “word clouds” from text that I provide, which give greater prominence to words that appear more frequently in the source text. It's fun as well as a revealing way to check out what my blog's predominant themes have been. So here are two Wordles. The first one comprises all the words in my current RSS feed. And here's the RSS feed as at the end of April 2011, comprising my first four bright-eyed and bushy-tailed posts! Apart from relishing the sheer beauty and poetry of some of the combinations, I'm glad to see some very clear and obvious similarities, as well as the less obvious threads in some of the smaller, less prominent words. 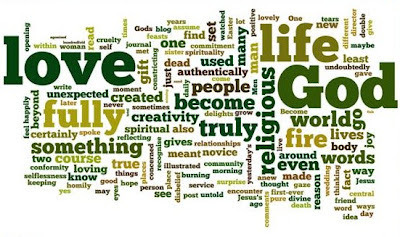 Some actual words may have changed, come and gone, but the underlying, recurrent theme has been God, that Love that will not let me go - and life, one of God's great gifts. It's good to see this, good to be reminded, good to take with me, as I begin my second year of blogging heaven! Happy Anniversary! 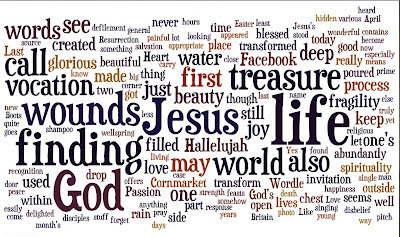 I'm looking forward to what thoughtful wonders, ponders, and slices of heaven the year ahead might hold for you...and how you generously share them with others through word, Wordle, and image! I'm so glad you picked up the keyboard and tapped! It is good, Silvana, to see how much the blog means to you and know that you will continue to share with us. As one who has tried to blog daily for several years now, it is good to sense your enthusiasm as I often seem to need to just share a quote from someone else; however, I do feel that blogging has become a real ministry for me and love the interaction with others because of something I may have written. Let us continue to encourage one another. 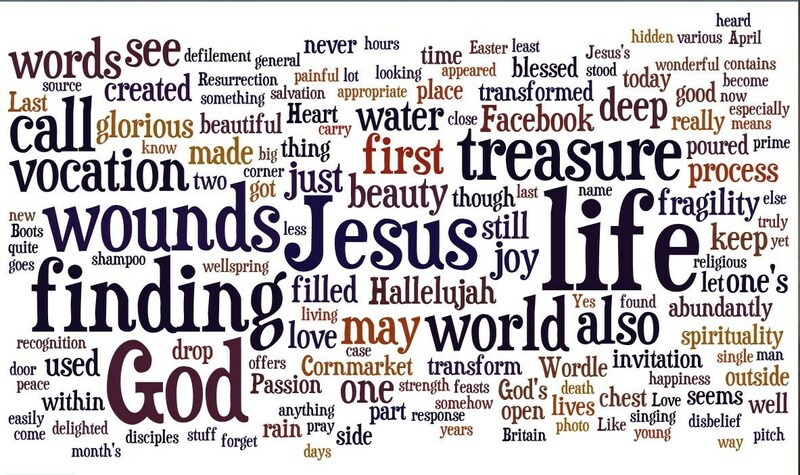 I love wordle but have not used it for years. You are encouraging me to want to try it again. I love your blog and you encouraged me to begin blogging. It has become a wonderful outlet for me also and I hope helpful in some way for others. One of the wonderful characteristics about blogging is there is no set schedule; it happens when the Spirit moves. Your blogs leave me with something to think about every time I read one. Happy Anniversary and thanks again. I too have loved your blog Silvana and look forward to it each week. What a great gift you share with others.